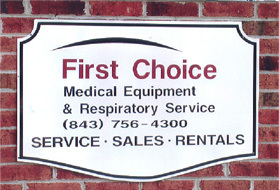 Established in 1983, First Choice Medical Equipment is proud to supply quality products and superior service to individuals, clinics, home health agencies, and physicians’ offices. We are accredited through Compliance Team, and we offer all brands and types of medical equipment, including specialty products like Jobst & Gottfried medical custom support stockings and post-mastectomy apparel. As a locally owned and operated business, First Choice Medical Equipment is dedicated to providing one-on-one personal care. Our friendly staff has in-depth knowledge of all the products we carry, and we’ll be glad to help you find the durable medical equipment and supplies you need when you need them. Trust in First Choice to deliver! We’ll be happy to discuss your unique needs, and provide you with the top-notch service we’re known for. Contact Us Today!